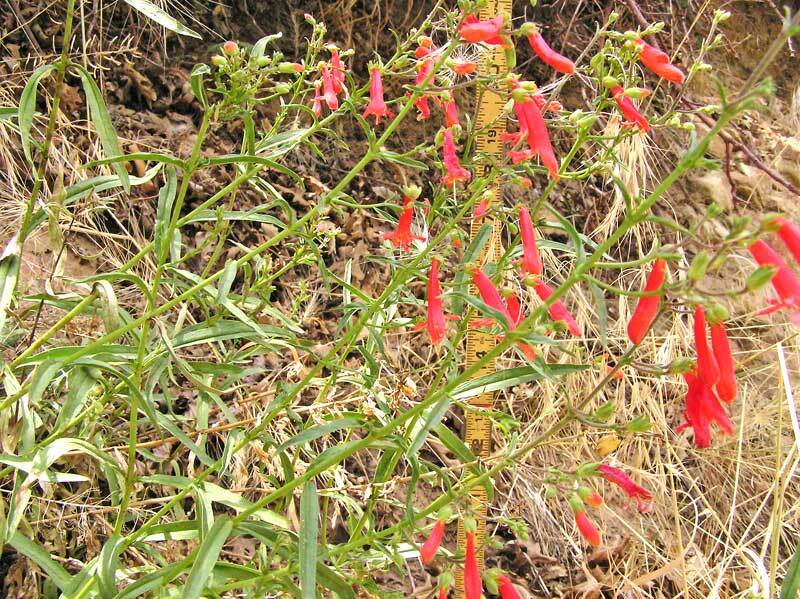 Genetic research in the 1990s and early 2000s showed that the Penstemon genus belongs in Plantaginaceae (Plantain Family), not Scrophulariaceae (Snapdragon Family). In North America there are over 250 Penstemon species, which ties it with Eriogonum for third most numerous. Carex has 480 and Astragalus 350 species. 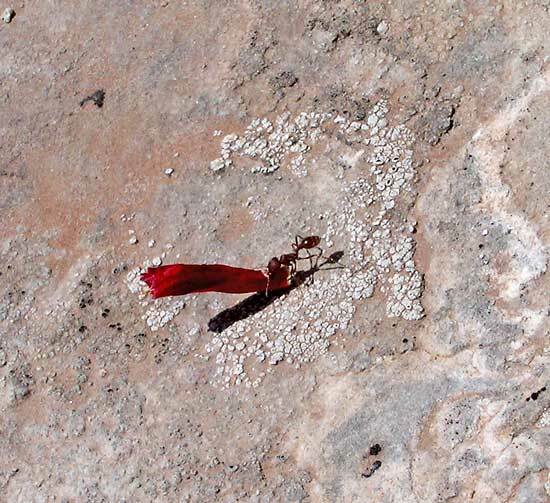 There are more than 36 Penstemons found in the Four Corners area, only surpassed by the Astragalus genus with 61. 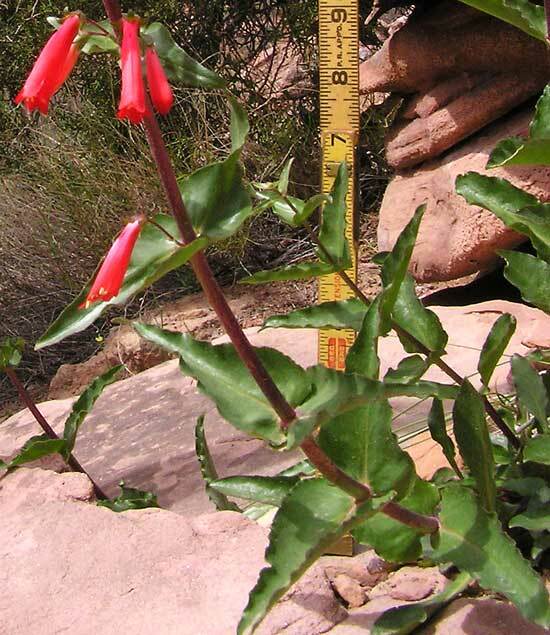 The Penstemon genus has 19 species on this web site. Eriogonum has 14. Astragalus has 31 species, and Erigeron 27. 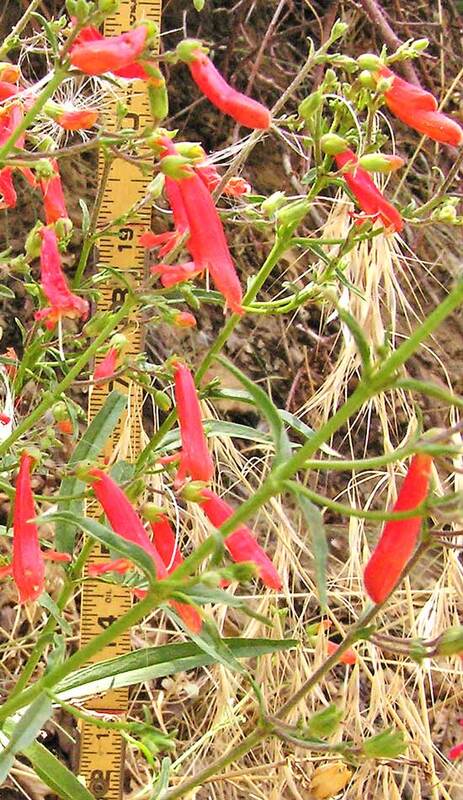 Penstemons are so attractive and popular that there is an American Penstemon Society. 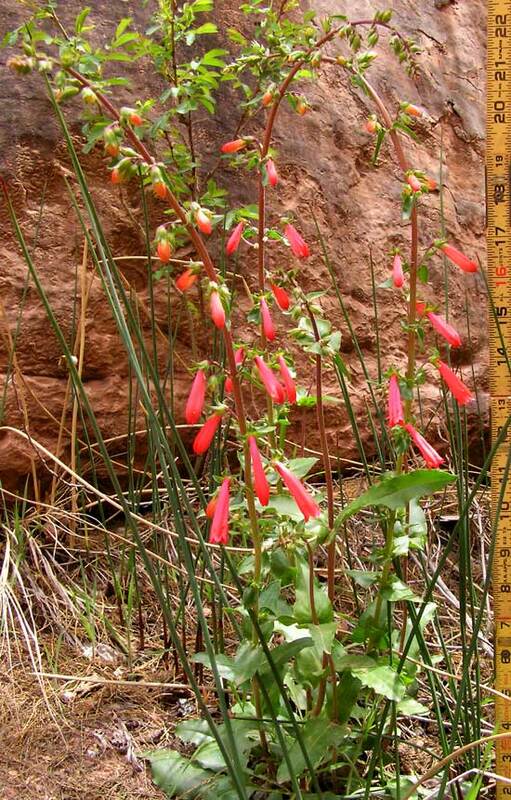 Description of Penstemon: A number of sources indicate that in 1748 the Penstemon genus was described and named by botanist (as well as cartographer, zoologist, physiologist, etc.) Dr. John Mitchell. 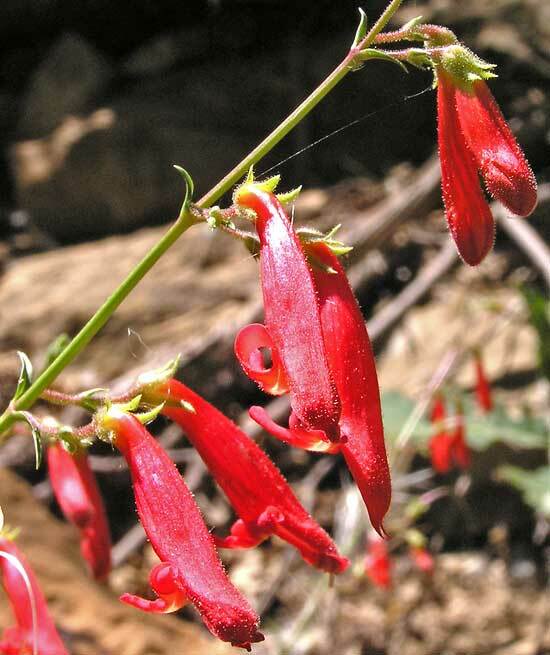 But Penstemon expert Craig Freeman and Flora of North America taxonomic expert, Kanchi Gandhi, indicate that the genus was named in 1762 by Casimir Schmidel. 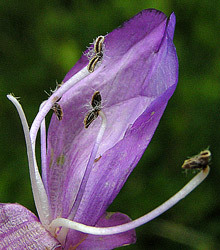 John Kartesz, ultimate authority for nomenclature on this web site, also indicates that the description of Penstemon should be credited to Schmidel. supported the "five" meaning of the first syllable. Whatever the derivation, the botanical word for a sterile stamen is "staminode", a modified stamen which does not produce pollen. You can see this staminode, this fifth structure which is nearly a stamen, at the left side of the above photograph. Notice that the staminode has a few hairs at its tip; some Penstemon staminodes are very hairy and most project outward toward the end of the lower lip of the floral tube. The hairiness and position of the staminode are important characteristics in determining the Pentosan species -- and are the source for one common name for the genus, "Beard Tongue". Above and left: Mesa Verde National Park, July 21, 2004. Penstemon barbatus is very common throughout the lower elevations of the Four Corners area, and it is abundant in Mesa Verde National Park. This is a very tall and lanky Penstemon, often growing to four or five feet with an abundance of flowers opening over many weeks. Stem leaves are long, narrow, and widely spaced. For a very similar species that is also abundant in the Four Corners, see Penstemon rostriflorus. Although the flowers of the two species are somewhat similar, the forms are quite different: P. barbatus is tall, lanky, and airy whereas P. rostriflorus is much shorter and crowded. Also, P. barbatus blooms in June and July and is flexible and herbaceous throughout. P. rostriflorus blooms from late June into October and is quite woody at its base. And most unusual for any of our local Penstemons, P. rostriflorus is commonly evergreen. 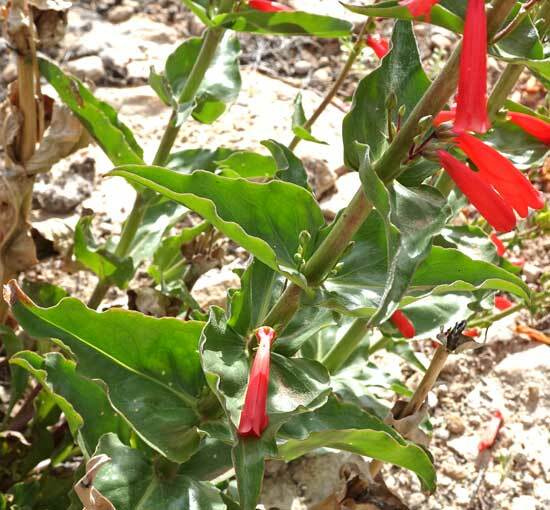 Penstemon barbatus was named by Albrecht Roth in 1846 from a collection made in Mexico. "Barbatus" is Latin for "hairy" or "bearded" and refers to the hairy flower throat of variety barbatus. Mesa Verde National Park, June 21, 2004. Canyons of the Ancients National Monument, June 6, 2005. 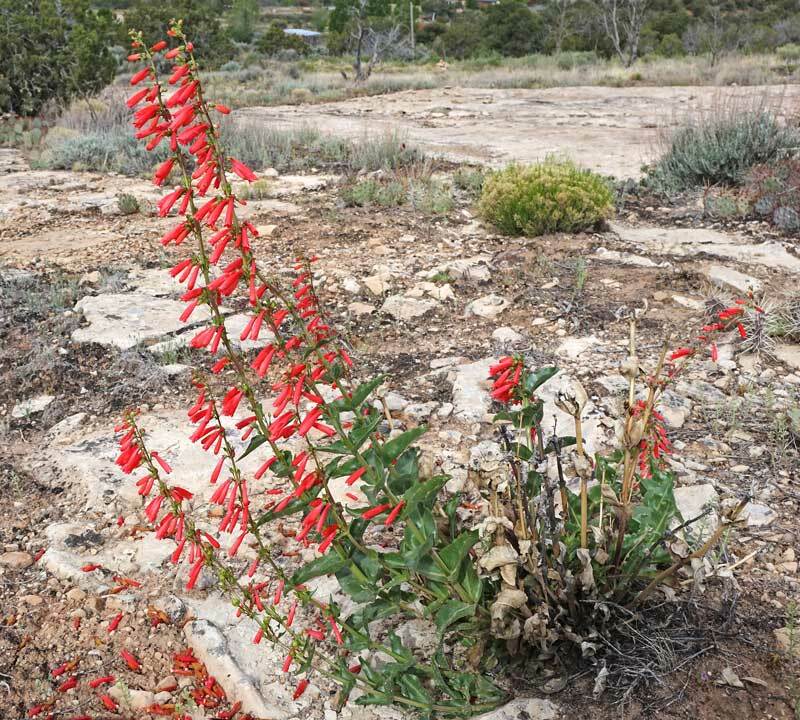 Penstemon barbatus, variety trichander (Greek for "hairy anthers") is found in all the Four Corners counties and in a few counties south of the Four Corners in New Mexico and Arizona. Canyons of the Ancients National Monument, May 25, 2016. 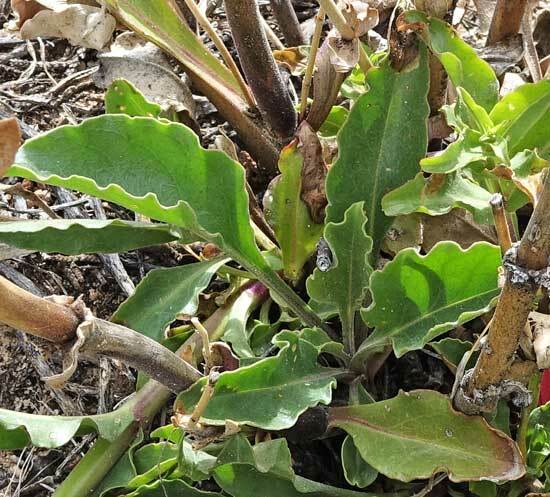 A young Penstemon barbatus, just 18 inches tall, shows the difference in the shape of the basal and stem leaves. Semi-desert, foothills. Openings, shrublands, woodlands. Spring, summer. Above: Canyons of the Ancients National Monument, May 11, 2016. 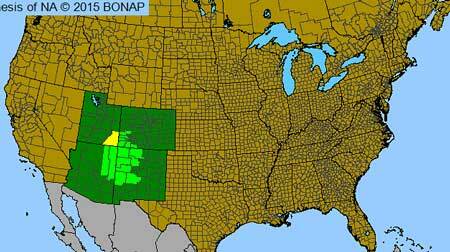 Left: Grandstaff Canyon, Utah, April 14, 2005. Sprawling or upright growth patterns are common for Penstemon eatonii. As is true for many Penstemons, flower stalks are often arched over near the tops and straighten as the stem gains strength. 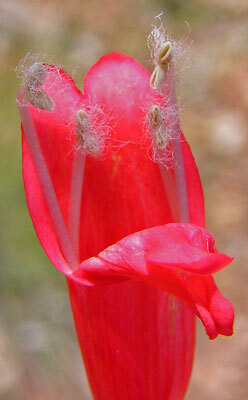 The corolla lobes are very small so that at a glance the flower appears to be a very narrow long closed tube. 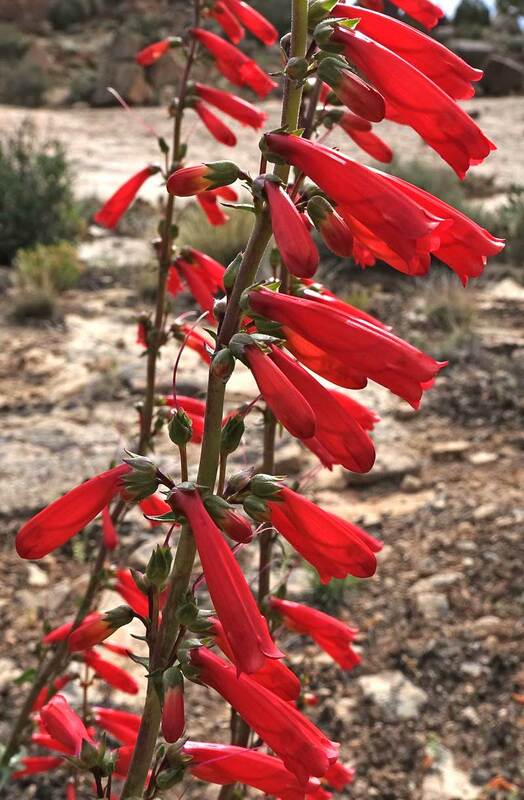 The blazing red of Penstemon eatonii is very common throughout the spring and early summer from trails in Mesa Verde National Park to open expanses of Utah and Arizona. Canyons of the Ancients National Monument, May 11, 2016. Leaf margins are usually crisped (wavy-edged) and leaves are typically lanceolate (but may be oblanceolate or broadly obovate). Stem leaves are cupped and clasp the stem (no petiole). The third photograph at left shows basal leaves which are typically a bit larger than stem leaves and have a petiole. Canyons of the Ancients National Monument, May 17, 2009. Did you ever wonder, "Where have all the flowers gone"?